1. Color pattern on the back of cards: red and blue. 2. Fournier No.12 small index, paper material. Big marks in the middle, 4 small marks, and also your customized marks. You can use invisible ink kit to mark the cards for infrared contact lenses and luminous glasses. You can also use infrared camera and video monitor to see the back marks of Fournier marked playing cards. What's more, you can marked it as barcode deck, to work together with poker scanning system, phone analyzer and scanner camera. In addition, different environment and different situation use different poker juice and invisible ink, so the effect is not the same. 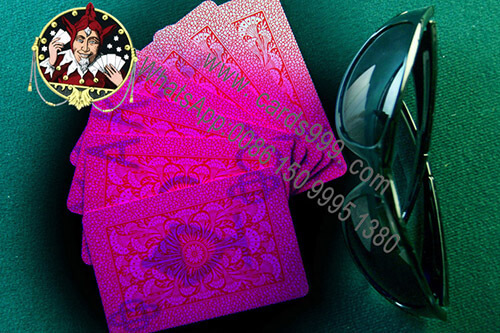 The best mark of marked playing cards is big font in the middle, for this kind of mark, you can see clearly. Also, the best lamps of marked cards contact lenses are Energy saving lamp and LED (white light). Compared with the quality and service, we are very confident, no matter our marked cards, playing cards sunglasses, and poker lenses and so on, all of them are better than others. No doubt that Golden Sunshine is the founder of marked poker cards and infrared contact lenses.